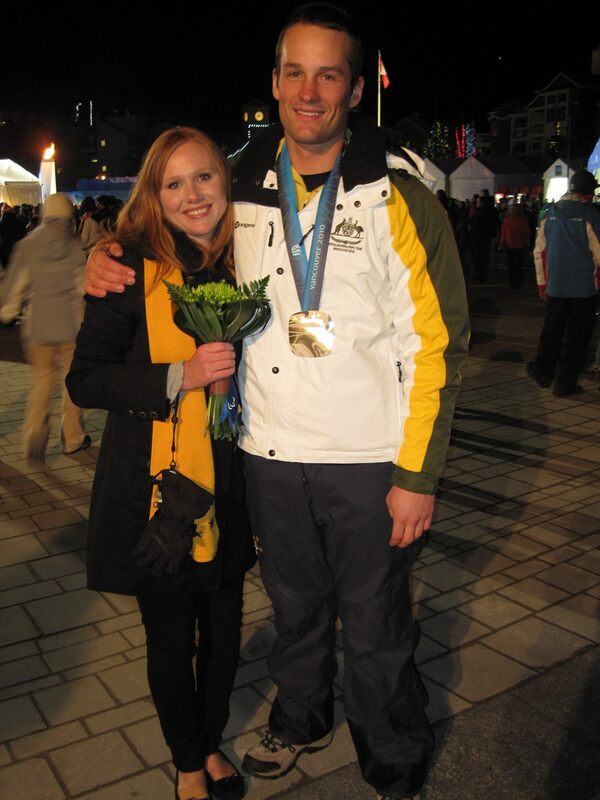 Marty shares his story, and his extraordinary achievements since surviving the disease, here. Meningococcus is a bacteria also called Neisseria meningitidis. There are 13 main subtypes (strains) of Neisseria meningitidis; different strains are common in different countries, but 90% of all disease worldwide is as result of either A, B, C, W135 and Y. In Australia the most common types are B and C.
It can cause two broad types of very serious disease: meningitis and septicaemia. Meningitis means infection primarily of the lining of brain, and septicaemia occurs when a bacterial infection enters the bloodstream. Meningitis can lead to septicaemia, and septicaemia can lead to meningitis, but often (especially early on in the infection) one type of disease is dominant. There are many other causes of meningitis and septicaemia other than Meningococcus, but this bacteria causes particularly dangerous versions of these diseases. Once infected, about 10-15% of otherwise fit and healthy young people will die, often within hours or days of becoming unwell. Of those that survive the disease, 20-30% end up permanently disabled with lost limbs, hearing, sight, and/or permanent neurological dysfunction including a loss of intellectual function. Meningococcal disease is scary, and it is important to be vigilant for the signs of such a dangerous disease as early treatment (such as antibiotics) can literally be the difference between life or death. If worried, phone for an ambulance or attend your local emergency department or GPs. Don’t ‘wait and see’, and don’t hesitate to return if you have seen someone but are still concerned, especially if they seem worse. Downloadable posters and flyers with these warning symptoms are available here. Photos of examples of the rash can be seen here. Not all of these symptoms may be present, and they may appear in any order. The rash may appear on any part of the body, and can be quite variable in appearance. It will usually not blanch under pressure, however (if you push a finger or glass against it it does not go pale, and can look more like a blood blister or bruise than a rash). Up to about 25% of the population can live with the bacteria in the mucous of their respiratory tract, without it causing disease. It is passed between individuals by exchange of respiratory fluids (eg kissing), or by droplet spread (coughing and sneezing). Passage between individuals is more likely where groups of susceptible people crowd together (eg child care centres, schools, camp, university halls of residence or dorms, army barracks) and in some individuals it can then go on to cause devastating disease. Once transmitted, the incubation period (if it is to go on to cause disease) is 2-14 days, and people are most contagious in the 3 days before symptoms develop. Vaccine recommendations for Meningococcal disease are quite variable according to what part of the world you live in, whether you are in a high risk group, and whether you plan to travel to other areas. 90% of Meningococcal disease is caused by subtypes A, B, C, W135 and Y. There is a vaccine available for each of these, and a combined one covering subtypes A, C, W and Y. In Australia currently the schedule includes Meningococcal ACWY at 12 months. This is a single dose, although funding is also being considered for a booster dose for adolescents. Meningococcal B is the second most frequent serotype in Australia, and a vaccine has recently become available for this. This is not on the schedule in Australia (i.e. it is not funded by Medicare), and needs to be paid for by individuals. It is recommended for children 2 months – 2 years, adolescents aged 15-19, and people of any age at high risk (eg those without a spleen). Recommendations for the under 6 month olds is 3 primary doses and a booster at 12 months, although fewer doses are needed if starting at an older age. A relatively common side effect of the new Meningococcal B vaccine is fever, so it is suggested that paracetamol be used with each dose (3 doses, each of 15mg/kg, starting at the time of the injection, and given at 6 hourly intervals afterwards. 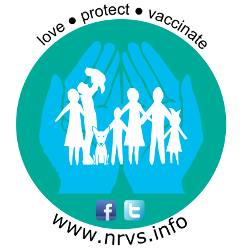 More information specifically about the vaccine available for Meningococcal B is available here. 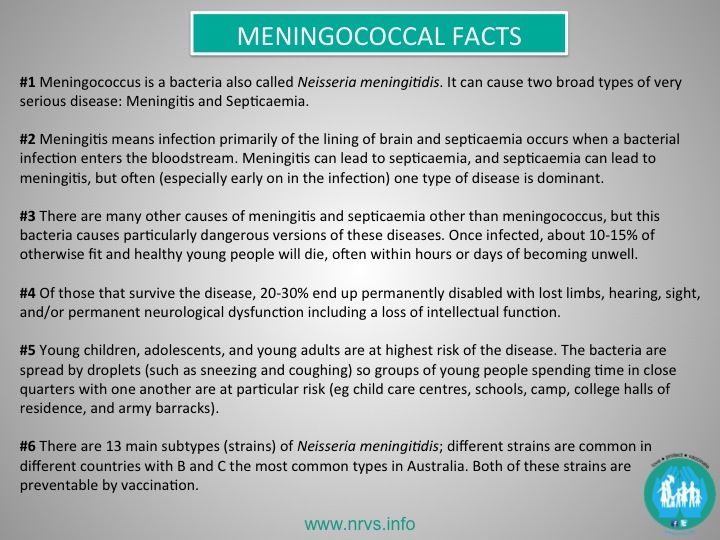 There are other types of Meningococcal vaccine for use in certain situations, such as for travellers to endemic areas (such as pilgrims attending the annual Hajj in Saudi Arabia), close household contacts of individuals with confirmed disease, or those at high risk (eg no spleen). Downloadable poster, flyers and fridge magnets are available here.